Back in October I got hooked on Meatless Monday's. Its been a fun challenge to learn new recipes that expand my vegetarian horizons. (Gwen even mentioned it on Goop!). 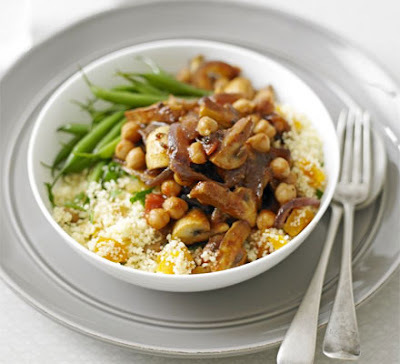 Recently, I made Moroccan Mushrooms with couscous and it has to be one of my all-time favorite culinary experiments. The flavor is exceptional and it is hearty enough to fool even the staunchest meat lover. Best of all it is easy! Thanks to Green Lashes and Fashion for the intro to this dish. You can find the recipe here. Hope you enjoy! Looks delicious! I will have to try it...especially if it is easy! this looks so great, i must try!! and by the way loved your post on india. my sister is there now doing yoga and we met up with her last year in april and its certainly a trip i will never forget, unbelievable, changed my life! That looks very yummy! the picture makes me so very hungry, I will have to give it a try! I wish I liked more vegetables. You do such a great job with them. YUM. I pretty much love mushrooms in any form! This dish looks absolutely delicious! this just looks absolutely yummy! my kind of meal.